Felines are wonderful creatures. In fact a home without a cat feels quite empty! Although they are “easy” pets to have around they too are faced with a variety of “common” problems ranging from those that are life threatening to those that upset their owners much more than the cat. Indoor cats have far fewer medical problems than cats that are free to roam about. They are not faced with possible injury from cars, unfamiliar dogs, strange cats and predators. They have less exposure to contagious disease. However, behavior “problems” are often more noticeable in cats that share space with their owners 24 hours a day! Outdoor cats, especially in high density urban environments, are often presented with injury, secondary to lifestyle, and contagious disease. Not all contagious disease can be prevented by vaccination. Parasitism is also prevalent in outdoor cats. Cat fight abscesses, and infectious disease spread cat to cat while fighting, are frequently seen in outdoor cats. Kittens are most frequently seen for viral upper respiratory infections and loose stool. The sneezing and running eyes are usually due to viral infections and secondary bacterial infections. Although loose stool is often related to dietary changes it can also be due to internal parasites. Panleukopeania (cat distemper) is seen in kittens from unimmunized cat populations. Ear mites infestations are commonly seen in kittens. Geriatric cats develop problems associated with aging. Chronic Interstitial Nephritis (kidney failure), along with its associated problems, Hyperthyroidism and stiffness are common in elderly cats. Skin problems such as Feline Exema, Feline Acne and Flea Allergy Dermatitis are commonly encountered. These are often associated with allergies and secondary bacterial infection. 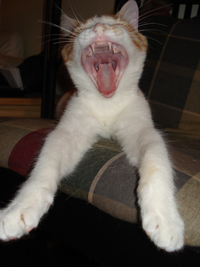 Dental disease is very common in cats. As explained in the dental care page dental health plays a large role in determining overall health. Diabetes mellitus is not uncommon in cats. Increased thirst, increased urination and eventually weight loss are cardinal signs of Diabetes mellitus. Cats that have been treated with steroids may have an increased risk for this metabolic disorder. Neoplasias, both benign and malignant are not uncommon in cats. They can manifest as lumps or insidious cellular infiltrations that are hard to detect by manual examination alone. Some are curable, some are manageable and some we have little control over…it depends of the type of neoplasia. 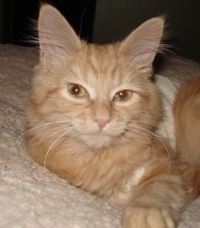 Urinary problems,both physical and psychological, are common feline problems. Struvite/oxylate crystals are common causes of inappropriate urination, staining and bloody urine. If this problem is not corrected it can lead to blockage of the urethra and/or bladder stones. Bacterial, and possibly viral, infections can lead inflammation of the bladder and urethra. Infections can also involve the kidneys. Cats with bladder irritation often display inappropriate urinary behavior. Prescription diets,fluid support and medications are used to rectify/control physical bladder problems. Occasionally surgery is required. Behavioral problems, often based on territorial behaviors or anxiety, can become a major problem in domesticated felines. What is a normal behavior in the wild, is often unacceptable in the home! Minimizing environmental stress is all that is needed in many cases. In others, pharmacological behavior modification is required. If your cat is urinating inappropriately do not ignore this behavior! Seek veterinary advise.